The California Horse Racing Board meets this Friday for the express purpose of considering reallocation of racing dates granted to Santa Anita Park, where 23 horses have died while racing or training since the opening day of the meet on Dec. 26. How did we get here? Let's take a look at the timeline of events. The first fatality came Dec. 30 after Psychedelicat was pulled up with a leg injury in a $16,000 claiming race on Dec. 30. Ten fatalities – seven during racing and three while training – occurred in January, including three on Santa Anita's iconic downhill turf course, where horses make the only right-hand turn in American racing and then cross over the dirt track and onto the inner turf course while making a left-hand turn. There were eight fatalities in February, five resulting from training injuries, including two on the morning of Feb. 23 when Battle of Midway – the 2017 Breeders' Cup Dirt Mile winner who had returned to racing after proving sub-fertile at stud – shattered the pastern in a hind leg. The eighth fatality came on the morning of Feb. 25 when Charmer John sustained a serious injury while training. Racing surfaces consultant Mick Peterson was brought in from the University of Kentucky and examined the main track while it was closed to training on the mornings of Feb. 26-27 (track officials had wanted to close the track for training Feb. 25 but were persuaded otherwise by horsemen). On March 2, three days after Peterson declared the track “100 percent ready,” Eskenforadrink suffered a fatal injury running over a sealed, sloppy racetrack in a $16,000 claiming race. 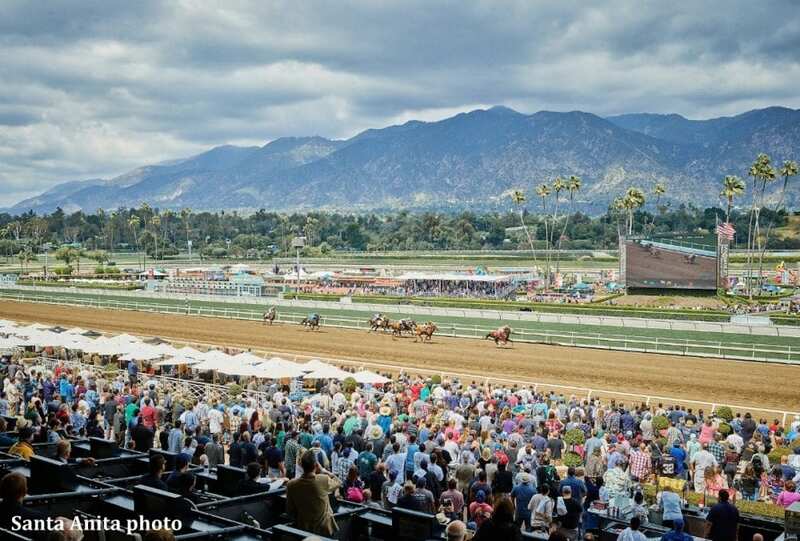 The following day, Santa Anita officials said it was cancelling one day of racing on March 7, citing a weather forecast calling for heavy rain. It was the latest in a series of winter storms that had made January and February among the coldest and wettest months on record in Southern California. On the morning of March 5, Let's Light the Way became the 21st fatality when the lightly raced 4-year-old filly suffered a catastrophic injury during training. Hours later, Santa Anita announced that former track superintendent Dennis Moore, widely respected by horsemen, would be retained as a consultant to oversee maintenance of the racing surfaces. Moore, the track superintendent at Del Mar and Los Alamitos, opted to leave his position at Santa Anita at the end of 2018, telling Santa Anita officials he wanted to slow down at the age of 69. Andy LaRocco, who had served as Moore's assistant for five years and worked on the track crew at Santa Anita for 37 years, was made track superintendent upon Moore's departure. After two days of a complete shutdown, the Santa Anita training track (inside the turf course) was reopened to jogging and galloping on March 8. The main track reopened for light training on March 11, and breezing over the main track was permitted on March 13 under new protocols instituted by management. Trainers were required to submit names of horses they wanted to breeze in advance so that officials could scrutinize their records for a risk assessment. On the second day breezing was permitted, on March 14, the maiden 3-year-old filly Princess Lili B fractured both front legs at the end of a half-mile workout timed in 53 seconds over the main dirt track, becoming the 22nd fatality. Later that day, The Stronach Group's chairman, Belinda Stronach, published an open letter to the industry with details that company officials had been floating privately: namely that Santa Anita was going to align itself with the International Federation of Horseracing Authorities on medication regulations and make other significant safety and welfare reforms, including restrictions on the use of the whip and the elimination of race-day Lasix. Stronach called the deaths of so many horses “heartbreaking” and “unacceptable.” She did not say Lasix or the use of the whip caused horses to break their legs, though those were the false talking points drafted by defenders of the status quo. The Thoroughbred Owners of California, which represents horsemen in California, could have fought the reforms Stronach was insisting on. Instead, its leadership looked at the gravity of the situation, the onslaught of negative media coverage, the public outcry and the fear of a future ballot initiative that could end racing forever in the Golden State. “Let's work together,” the TOC said. Through discussions, the immediate Lasix ban sought by Stronach became a reduction, by 50 percent, of the amount that can be given on race day, with the pledge that race-day administration of the drug used to treat exercise induced pulmonary hemorrhage would be phased out beginning with foals of 2018. The TOC agreed to other reforms – including tighter restrictions on anti-inflammatories and joint injections – which would go into effect when racing resumed at Santa Anita on March 29. For its part, The Stronach Group developed enhanced safety measures and veterinary checks for both training and racing and continued to push for greater transparency on veterinary records. On March 28, the California Horse Racing Board signed on to the reforms, along with passing a new rule that would take effect in the coming months eliminating the use of the riding crop for anything other than corrective or safety purposes. Still, on March 31, on the third day racing resumed at Santa Anita after a three-week hiatus, a horse named Arms Runner became the 23rd fatality since Dec. 26 and the fourth death in March when he suffered a catastrophic injury crossing over the dirt track during the San Simeon Stakes on the downhill turf course. In the wake of that tragedy, officials have suspended sprints on the downhill course until further notice. Four live programs since March 31, including last Saturday's nationally televised Santa Anita Derby, have been conducted without any serious injuries. Since March 14, to my knowledge, there have been no fatalities during morning training hours. Southern California's cold, wet winter is in the rear view mirror. I'm no expert on track surfaces, but race times suggest the main dirt track at Santa Anita is deeper and slower than before. Does that translate to safer? I would think so. Problematic races on the downhill turf course have been suspended. The most stringent safety protocols and medication regulations in North America are in place for both training and racing. All of these factors appear to be working, yet there will be another fatality at some point. It is inevitable. It will be just as heartbreaking as when any of the previous 23 horses died at Santa Anita or when any of the other 1.68 horses per thousand starters across North America died in races in 2018 – the number estimated by The Jockey Club's Equine Injury Database. Yes, something should have been done sooner than late February at Santa Anita when track management acknowledged that there was a problem and brought in Mick Peterson to inspect the racetrack. Yes, racing's leaders, in California and elsewhere, should have been looking at whether anti-inflammatory drugs and repeated injections of corticosteroids into the joints are in the best interests of the long-term health of Thoroughbreds. Yes, veterinary records should travel with the horse when it transfers from one owner and trainer to another. And yes, we should be concerned about how the general public views the whipping of Thoroughbreds to make them run faster and whether horses who need bleeder medication on race day should be racing at all. But this is not a time for California racing to retreat, or for Santa Anita's dates to be surrendered to another track. We are in uncharted waters, but substantive changes for the welfare and safety of horses and jockeys have been made – thanks to the leadership of Belinda Stronach, the understanding and cooperation of California horsemen through the TOC, and the regulatory support of the California Horse Racing Board. Those changes should be allowed to run their course. This entry was posted in NL Article, Ray's Paddock and tagged belinda stronach, California Horse Racing Board, Dennis Moore, downhill turf, equine deaths, Equine Injury Database, Horse Racing, horse racing reform, lasix, Mick Peterson, Ray Paulick, riding crops, Santa Anita fatalities, The Stronach Group, thoroughbred owners of california, thoroughbred racing, View From the Eighth Pole, whip debate by Ray Paulick. Bookmark the permalink.